Inlaws & Outlaws will be shown as part of the Seven Straight Nights for Equal Rights vigil Raleigh, NC. 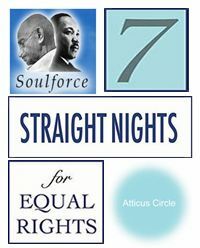 This FREE screening will help Atticus Circle and Soulforce raise awareness and support for the Seven Straight Nights for Equal Rights vigils across the country. The screening takes place on Friday, October 12th, 2007 at 9:00pm. This will be an outdoor screening at the North Carolina state Capitol in Raleigh. This screening is one of several Seven Straight Nights for Equal Rights vigils that will be showing Inlaws & Outlaws. Find out more here. On October 7-13, 2007, straight people across the nation will "come out" as supporters of equal rights for gay and lesbian Americans. From Santa Rosa, California, to Montgomery, Alabama, to Augusta, Maine, overnight vigils will light up American cities, providing unprecedented visibility to heterosexual men and women with the conviction to stand up for their gay and lesbian friends and neighbors. This grassroots groundswell, dubbed Seven Straight Nights for Equal Rights, was initiated by Soulforce and Atticus Circle, two Texas-based organizations with members across the nation. With their support, straight community leaders are organizing vigils in towns like Greenville, South Carolina, Shreveport, Louisiana, Duluth, Minnesota, and Salem, Oregon. These courageous community leaders are showing their elected officials that equality is not a gay issue, not an urban elite issue, not an east coast or a west coast issue -- it's an American issue, and Seven Straight Nights is making Americans' support for lesbian and gay equality visible as never before.